Will the U.S. create a single-payer health system? After a raucous debate lasting nearly a year, the Democrats are united on health care. But that unity does not include a call for a single-payer “Medicare for all” health system. 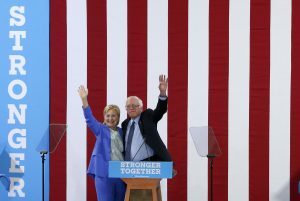 “This campaign is about moving the United States toward universal health care and reducing the number of people who are uninsured or under-insured,” Sen. Bernie Sanders (I-Vt.) said Tuesday in endorsing his rival Hillary Clinton, the presumptive Democratic presidential nominee. Sanders did win a few health care concessions in the negotiations leading to the endorsement. Clinton vowed to support more funding for community health centers and access to a “public option” government insurance plan, which she has supported in the past. But on Sanders’ top health priority — his “Medicare for All” plan — there was not a word. At the Democratic Platform Committee meeting over the weekend, an amendment to add a single-payer plan to the document was defeated. It wasn’t much of a surprise. Most health policy analysts — including those who are sympathetic to the idea — say moving from the current U.S. public-private hybrid health system to one fully funded by the government in one step is basically impossible. And that’s making a huge assumption that it could get through Congress. “To try to do it in one fell swoop would be massively disruptive,” said Paul Starr, a professor at Princeton who was a health policy adviser to President Bill Clinton. In moving to a single-payer system, he said, “you’re talking about reallocating $3 trillion, reducing people’s incomes and creating” in effect a single entity that would set prices for all medical services. Single-payer supporters dispute the idea that getting from here to there could not be done. One of the biggest is exactly how to redistribute literally trillions of dollars. The problem, said Harold Pollack, a professor at the University of Chicago, is that the change will create losers as well as winners. “Precisely the thing that is a feature for single-payer proponents is a bug for everyone who provides goods and services for the medical economy,” he said, since their profits — and possibly their incomes — could be cut. And it’s not just the private insurance industry (which would effectively be put out of business) that could feel the impact to the bottom line. Parts of the health care industry that lawmakers want to help, like rural hospitals, could inadvertently get hurt, too. Many rural hospitals get paid so little by Medicare that they only survive on higher private insurance payments. Yet under single-payer, those payments would go away and some could not make it financially. “You would not want to wipe out a third of the hospitals in Minnesota by accident,” Pollack said. “And you could,” if payments to hospitals end up too low. There’s also the question of whether it’s simply too late to go back to the health care drawing board. The last industrialized country that did the switch was Taiwan, in the mid-1990s. Taiwan, however, with its 23 million residents, has a population larger than New York and smaller than Texas, and had no existing private health insurance system at the time. “What I’ve often said is we could have done this in the 1940s when Harry Truman proposed it,” said Starr, who has written at length on the history of American health politics. “Health care at that point was probably about 4 percent of [gross domestic product] and there existed at that time a relatively small private insurance industry.” Today health care spending in the U.S. is approaching 18 percent of the nation’s GDP and the private health insurance industry accounts for half a trillion dollars per year. Both Starr and Pollack, however, said it would be possible to make a switch, although it would have to be carried out over a very long period of time. “You could imagine some kind of long transition, where you gradually expanded Medicare,” said Starr, “for example moving it down to age 55” and then in later years continue to lower the age threshold. But even if the U.S. did manage to execute a single-payer system, said Pollack, it would likely prove problematic, particularly in how it would be financed. Kaiser Health News is an editorially independent program of the Henry J. Kaiser Family Foundation, a nonprofit, nonpartisan health policy research and communication organization not affiliated with Kaiser Permanente. You can view the original report on its website.